A specific trading chart rule-based trendline is named a support line because you expect the line to support the price — stock traders won’t let the price fall below it. You start at the lowest low and draw a line to the next low. This generates a line that can be extended at the same slope, but it becomes a trendline only when another daily price low touches the line and bounces off it. This touch-bounce is confirmation that the line is more than just a line and is a true trendline. Some technical traders say that to require a third touch is to be overly cautious and to miss out on some perfectly good trends that fail to meet the third-touch qualification. This is true — many valid trends do have only two touches before they end. If you’re waiting for the third touch, you may miss the entire move. But, experience shows that your trust is better placed in a trendline with three or more touches. You’re taking more risk if you accept two touches. Buy on the third touch of the support line by the low of a price bar. Sell when the low of the price bar falls below the support line. You use the support line to identify an uptrend. The price is rising, and rising consistently. This provides comfort that the purchase of this security is returning a profit and may continue to return a profit. Breakout: When any part of the price bar penetrates the line on the downside (a breakout), support has been broken, and you may deduce that the trend is over. However, this trend end may or may not be true. In the preceding figure, the move continues after the line was broken — but experience teaches that the trendline is no longer reliable. False breakout: Sometimes the low extends beyond the support line for just one day, and then prices obediently fall back into line. Subsequent prices respect the support function of the line. A one-day break of the line is called a false breakout. The word false is misleading because the price really does break the line; what’s false is the conclusion you draw from it. 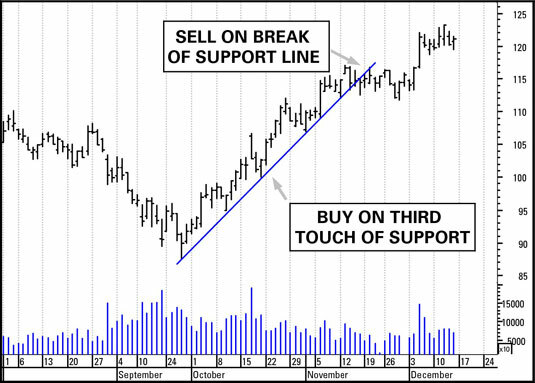 Discard the support line as a trading tool after it has been broken. However, you may want to leave it on the chart for a while. Sometimes old support becomes new resistance and vice versa.